Doris Iliff, age 94, of Aurora, passed away Saturday, January 7, 2017, at Hamilton Manor. Funeral Services will be held 10:30 A.M., Wednesday, January 11th at the Aurora United Methodist Church. Rev. Karla Sheffy will officiate. Interment will be in the Aurora Cemetery. Visitation will be from 5 - 7 P.M. Tuesday at Higby-McQuiston Mortuary. Memorials may be made to the Aurora Senior Center or the Aurora United Methodist Church. Condolences may be e-mailed to the family through the mortuary website at www.higbymortuary.com. Doris M. Iliff, the daughter of August and Maggie (Hinton) Hagemeister, was born in Frontier County, Nebraska, on June 24, 1922, and passed away at Aurora, Nebraska, on January 7, 2017, at the age of 94. She graduated from Aurora High School and attended Kearney College to be able to teach country school. Doris taught rural grade school in Hamilton County for six years. On May 27, 1946, she was united in marriage to Dale Vernon Iliff, at Belleville, Kansas. They farmed in southern Hamilton County, and in 1984, they retired and moved into Aurora. Dale passed away on December 13, 1988. 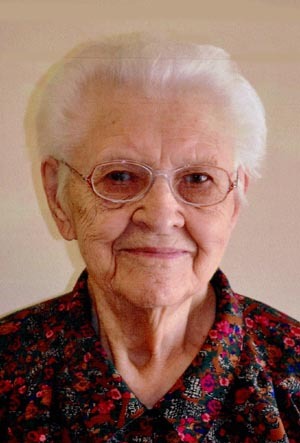 Doris was a member of the Aurora United Methodist Church. She really enjoyed playing cards, cooking, gardening and spending time with family and friends. Doris liked spending time at the Senior Center over the past years. She was preceded in death by her parents; husband and son, Vernon and seven siblings. Those who remain to cherish her memory are her daughter Carolyn (Myron) Fasnacht of Lincoln; daughter-in-law, Cindy Iliff of Lincoln; 4 grandchildren, Jason (Lisa) Fasnacht of Lincoln, Scott Fasnacht of Springfield, Nicholas Anderson of Lincoln, and Bryce Iliff of Lincoln; 6 great-grandchildren; and many nieces and nephews and other relatives and friends.